Facebook’s censorship team closed temporarily the page of the famous “cartoons” magazine the New Yorker. Throughout the world, The New Yorker magazine is reknown and recognized, for the quality of its reporting, the depth of its investigations, its team’s sole dedication and complete verification of fact and fictions in its cultural sections and drawings. 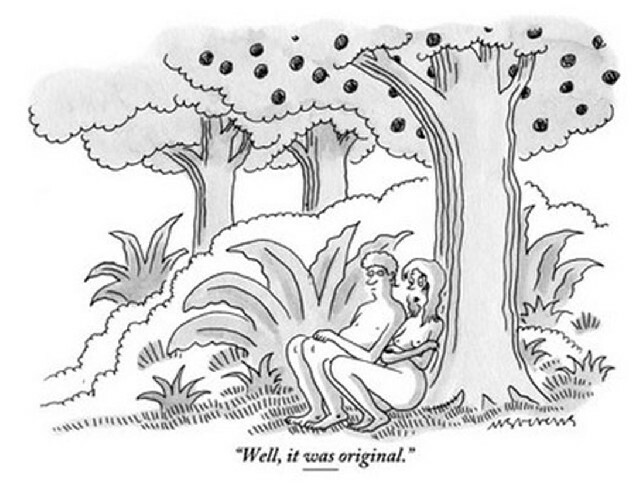 This is precisely why one of its humouritic cartoons landed the New Yorker on facebook censors list. By clicking on https://www.facebook.com/NewYorkerCartoons, the message that appears states that the page has been temporarily closed and prohibited. The culprit is a pair of breasts. To retrieve the page and out of its “boobgate” the New Yorker announced that it was removing the offending drawing, and have republished it after artist Mick Stevens has modestly covered his characters’ private parts. “However, adding clothing caused a loss in the humor ethos that was so important in the drawing” notes the magazine who ironically is asking its readership, to help identify all the offensive double-points (used to suggest a pair of breasts). But the social network Facebook has also another set of law stipulations or charts, including a version used by a provider that has been published by the website Gawker on http://gawker.com/5885836/facebook-releases-new-content-guidelines-now-allows-bodily-fluids. This chart describes and details in 13 pages, a series of examples where the exemptions to the rules are listed and that should be followd by Facebook team of censorship.